← Why Should You Always Be Job Hunting? 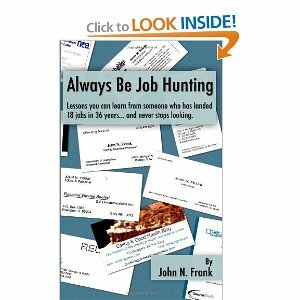 While you can buy Always Be Job Hunting on Amazon.com, other outlets also are carrying my new book that will help you get a job and plan your career moves. If you are in the Chicago area, you can pick up a copy at Jay’s Barber Shop , 1579 Maple St. in Evanston. You may even see me there getting a haircut some Saturday soon, they do great work. Victor, who now runs the shop, has been kind enough to display my books for the scores of men who walk in for haircuts there. Some of them must be job-hunting, I would think. If you’re a Barnes & Noble fan, its online store also now has Always Be Job Hunting. I was surprised to see it there, since I had published it through an affiliate of Amazon, but apparently that affiliate also sells it to other bookstores and libraries, so let me know if you see the book elsewhere. I also found it on a site called alibris. Wherever you decide to buy it, I know you’ll learn important lessons from it and I look forward to discussing those with you here.